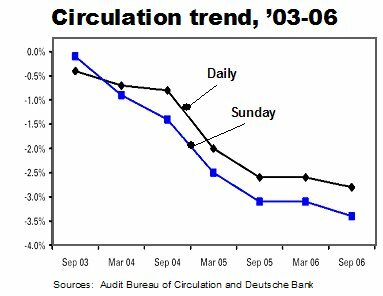 To no one’s surprise, circulation continued sliding at most of the nation’s metro papers over the last six months. But a significant portion of the decline results directly from the industry’s long-term, and arguably long-overdue, initiative to eliminate inefficient vanity and promotional circulation. Average circulation in the last six months fell 2.8% daily and 3.4% Sunday, according to an Editor & Publisher analysis based on reports from the Audit Bureau of Circulations, the industry-funded monitoring group. Some of the drop, doubtless, results from the growing popularity of the digital media. Squeezing lemons into lemonade as fast as it could, the Newspaper Association of America responded to the circulation drop with a study reporting that nearly 57 million Americans visited newspaper websites for an average of 1.37 minutes per day in September. Notwithstanding the demographic and competitive pressures eroding newspaper readership, a notable, if not precisely quantifiable, portion of the loss results from a strategic restructuring occasioned by the industry’s need to bolster its profitability in the face of weak sales. :: Vanity circulation – Publishers increasingly are deciding to stop schlepping papers to thinly penetrated locations far from their core markets. Beyond being an expensive indulgence, vanity circulation is little prized by most advertisers. It makes perfect sense to say bye-bye to the boonies. :: Discount circulation – Although 60% of a typical metro’s circulation consists of loyal subscribers who pay full price, a paper trying to maintain level circulation from year to year is forced to run continuous discount promotions to gain enough “readers” to make up the other 40%. As most advertisers will readily agree, it makes perfect sense for publishers to get off this high-cost, no-win treadmill. :: Third-party circulation – A few years ago, newspapers got the idea that they could beef up their circulation by getting third parties, like hotels, schools and car dealers, to buy discounted papers that then would then be given to “readers” for free. Given the high cost of producing – and the dubious value of advertising in – giveaway papers, it makes perfect sense for the industry to junk this junk circulation. Newspaper publishers, whose shares have been battered in recent years, must envy the Altoids-like stock market debut of Gatehouse Media. Like the addictive mints in the metal box, this IPO was curiously strong. A collection of 75 small dailies and 348 non-daily products scattered across 18 states from Massachusetts to California, Gatehouse had an explosive initial public offering last week, gaining 22% in trading at the New York Stock Exchange to close Friday at $22 per share. In the process, Gatehouse emerged as, by far, the most valuable newspaper company in the land. 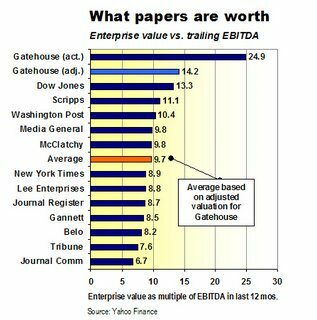 As illustrated in the table below based on statistics from Yahoo Finance, the $1.23 billion enterprise value of Gatehouse, which is 24.9 times its operating cash flow over the last 12 months, is more than twice the average value of the publicly traded newspaper companies. Enterprise value is calculated by adding together a company’s market capitalization and debt, plus or minus a few technical adjustments. Operating cash flow, commonly known as EBITDA, measures a company’s earnings before the costs of interest, taxes, depreciation and amortization. The ratio between enterprise value and EBITDA is a key metric in valuing newspaper companies when they are bought and sold. You can gauge the sentiment of financial types toward the industry by comparing the ratios paid in recent deals. Higher multiples reflect the expectation of vigorous sales and profit growth; lower multiples suggest the opposite. Notwithstanding the negative trend in industry multiples, it must be pointed out that certain recent strategic newspaper transactions have taken place at double-digit multiples. MediaNews paid 11.5x EBITDA to buy two prominent Knight Ridder dailies that nearly tripled the size of its cluster in Northern California. And Community Newspaper Holdings announced last week that it is paying 11.3x EBITDA for a group of papers being divested by Dow Jones. Still, these double-digit deals were valued at rates considerably lower than Gatehouse. The limitation of valuing a company based on trailing earnings is that the formula doesn't take into account acquisitons or mergers that fundamentally change the business going forward. This is the case with Gatehouse, which in June bought two newspaper groups covering 1 million suburban households in the Boston area. On a pro forma basis, the Boston transaction added an estimated $184 million in sales to the $205 million in revenues generated by the company in 2005. If you assumed that Gatehouse had owned the Boston properties for the last 12 months and operated them at the same level of profitability as the rest of its holdings, then the pro forma trailing EBITDA for the company would have been something like $86.3 million, according to information gleaned from the prospectus Gatehouse filed with the Securities and Exchange Commission. From this perspective, it is fair to view the company’s value at 14.2x EBITDA, not 24.9x. Even after taking this adjustment into account, however, Gatehouse – with an adjusted enterprise value 46% greater than the industry average – remains the most expensive newspaper stock of them all. Will this Wall Street honeymoon have legs? An anticipated wave of low-priced Chinese newsprint may help newspapers control the cost of their chief commodity in 2007, according to paper-industry analysts. 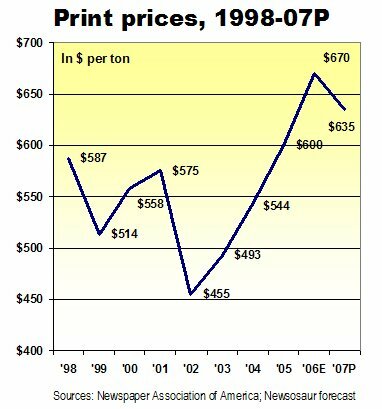 After rising nearly 50% since 2002, newsprint topped out near $700 per metric ton earlier this year and began declining over the summer to about $670 as the result of weak demand. Newspapers are buying less pulp for three reasons: Lower circulation, reduced advertising lineage and tighter newsholes. Newsprint generally represents about 10% to 15% of the operating expenses of a newspaper. Price increases – unless offset by reduced consumption – eat directly into the bottom line. So long as revenues are at least stable next year, cheaper print should make it easier for newspapers to make their numbers. With Chinese mills efficiently cranking out more print than can be used in their country, their output is expected to begin landing on the West Coast within a matter of months, according to Mark Wilde of Deutsche Bank and other industry analysts. 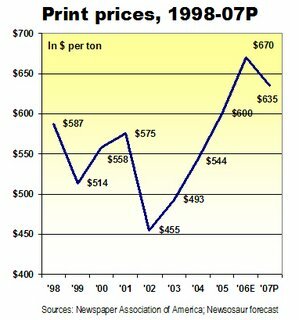 At that rate, the price for newsprint could drop as low as $620 per ton next year, delivering a savings of approximately $450,000,000 to the industry, assuming that consumption remains near the estimated 9 million metric tons expected to be purchased this year. Recent evidence suggests that newsprint consumption will continue to fall. After peaking at more than 12 million tons per year in 2000, consumption dropped to a bit more than 9.6 million tons in 1995, according to the Newspaper Association of America, the industry trade group. Propelled by aggressive paper price increases and even more aggressive efforts to defend their shrinking profit margins, publishers have been making newspapers shorter and skinnier in order to cut pulp consumption. Last year and this, many newspapers shortened their pages to save on paper. They also have eliminated stock listings and squeezed their ad-to-edit ratios to tighten print consumption. With newsprint demand already soft, the last thing North American pulp producers need is an influx of cheaper product from China. Like it or not, says Mark, the North American producers will be forced to match the lower import pricing – and probably also will cut production in an effort to prevent unsold product from clogging the market and putting more downward pressure on prices. Though pulp friction may bad news for paper makers, it could be a plus for publishers. The massive cuts at NBC Universal could be the first step in spinning the network out of General Electric, a company known for aggressively jettisoning business units that are past their (prime)time. In a plan called NBCU 2.0, operating expenses will be reduced $750 million by the end of next year through the termination of 700 positions (5% of the work force) and the elimination of costly programming in the first hour of prime time. First, it could go public, as did CBS when it was spun out of Viacom earlier this year. CBS stock is up nearly 10% since the free-standing company debuted in January, 2006. Second, NBCU could be taken private by investors who would further burnish its performance with a view to exit within three to five years. Universal might be split from the television properties as a separate operating unit, or the whole business could be kept intact. While the classic broadcast business has been faltering, the television networks remain powerful brands with unparalleled visibility, reach and revenue. Their problem is that they are hooked, 1950s-style, on trying to sell enormously expensive, lowest-common-denominator content to viewers (especially young ones) who find it increasingly irrelevant. It’s not that kids don’t want to watch television. Rather, they don’t like what’s on. Unlike their elders, who for the most part have grown from contented tater tots into full-fledged (and full-figured) couch potatoes, young people know where to find what they want. They go online, where the choices are prodigious, peers steer them to the best stuff and gratification is instant and usually free. Sites like YouTube, MySpace and Yahoo’s Flickr have achieved rapid growth by making a tsunami of home-grown content immediately accessible to the millions of consumers who in an earlier age would have been perfectly happy watching Bonanza. Notwithstanding the bodacious page views rolled up by the online sites, they represent a major problem for advertisers, because they deliver only micro audiences that are hard to measure, impossible to predict and, consequently, all but prohibitively inefficient to access. Predictability, it must be emphasized, is a major issue, because the unedited nature of the web means that an advertiser could be embarrassed at any moment by inappropriate, offensive or downright illegal content. If the increasingly flush Google combined the reach, scale and promotional power of NBCU with the technology, creativity and energy of YouTube, it would be combining the best of both worlds. Costly network content would be supplanted by do-it-yourself programming from literally a world full of wannabe producers, vying for airtime, recognition and perhaps a small honorarium based on the size of the audience they attract. What reality show could be more real than a competition among producers battling to keep their reality shows on the air? Far from being laid-back or lean-back, the viewers at home would be fully engaged in the show. Not merely voting American Idol-style, they would be encouraged to contribute to the show via clips and comments dispatched through email, Skype, webcam or cell phone. The considerable national attention created by the TV show could be directed back at the YouTube web site, creating targeted and interactive advertising opportunities of far greater value that even the dime-per-click keyword ads that turned the Little Search Engine That Could into a 21st Century media juggernaut. The technology necessary to put the buzz back in broadcasting exists today. Apart from a few billion bucks from Google to get the ball rolling, all GooTube-NBC would have to do is establish safeguards to assure that the new do-it-yourself content was acceptable to the audience, the advertisers and, last but not least, the Federal Communications Commission. While this is sorted out, it wouldn’t hurt to have a big bottle of Maalox in the control room. 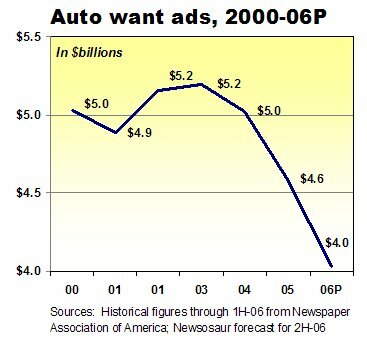 Auto classified revenues appear to be headed to a 10-year low in 2006, with slim chances of an upturn in the future. Based on the dismal sales of several major newspaper chains in the third quarter, it appears that total automotive classified revenues for the year may tumble to as low as $4 billion, a level last seen in 1996. Auto sales fell 15% to $1.8 billion in the first half of this year, as compared with $2.1 billion in the same period in 2005, according to the Newspaper Association of America, the industry-supported trade group. While total statistics for the third quarter of this year are not yet available, automotive classified revenues in the period fell 10.1% for Gannett, the largest publisher; 12.2% for McClatchy, the No. 2 publisher; 15.7% for Journal Register; 29.1% for Journal Communications, and 30% for Media General. Based on these results, I have estimated conservatively that auto ad sales will fall a minimum of 10% in each of the third and fourth quarters of this year. At that rate, total annual sales will be $4 billion. Given the velocity of decline in the first nine months, this bleak estimate may prove to be too generous. Apart from the explosion of help-wanted advertising that accompanied the Bubble between 1995 and 2000, car ads historically have been the biggest contributor to the holy trinity of highly profitable want-ad categories. Real estate, of course, is the third of the trio. Although auto advertising remains among the top three classified revenue producers for most publishers, auto volume now actually trails the “other” category at Journal Register, according to CEO Robert Jelenic, who made the disclosure in a quarterly conference call with investors. The “other” category includes incidental ads for things like garage sales, pets and firewood. Classified ads of all types collectively contributed 36% of the industry’s $47.4 billion in print sales in 2005 and an equal or greater percentage of its profits. When want-ad sales falter, the industry shudders. And it has had plenty to shudder about since the mid-1990s, given the rise of such low- and no-cost web competitors as Monster, AutoTrader, eBay and Craigslist. In addition to suffering from the structural shifts caused by the new media, classified ads also are highly sensitive to cycles in the economy. As demonstrated by the record $8.7 billion in recruitment ads purchased in 2000, the business booms when times are good and busts when they aren’t. Emphatically proving this point, $3 billion worth of job ads, or 34.5% of the business, vanished when the Bubble fizzled between 2000 and 2001. The question regarding the current decline in auto advertising is whether it is structural or cyclical and, thus, whether the downturn is permanent or transient. Unfortunately for publishers, the evidence is growing that the change is structural, making for a negative long-term prognosis. In addition to competition from online auto sites (including Cars.Com, which was created by several leading publishers to capture some of the web sales lost to print), the structure of the local auto-advertising marketplace is about to be irrevocably altered by a significant contraction in the number of dealers available to buy ads. In a move expected to be followed by General Motors and Chrysler, Ford wants to cut the number if its dealers by 14% over the next three years to 3,700 from 4,300, says securities analyst Paul Ginnochio of Deutsche Bank. Coming on top of an 11.8% reduction in Ford outlets over the last decade, there will be considerably fewer Ford dealers in your future. The 18 largest urban areas are targeted for the bulk of Ford's dealer consolidations, which will be especially hard on the metro newspapers challenged by high fixed costs and shrinking revenues. But you can’t blame the troubled domestic auto makers for wanting to thin their unwieldly dealer networks -- or dealers lining up to take the hefty cash buyouts offered by Detroit to encourage them to go away. In cutting the number of dealerships, Ford and other domestic automakers hope they will improve profitability for the survivors. If dealers are feeling more flush, that could be a plus for newspapers and the other media, like radio and TV, who covet their ad budgets. On the other hand, a reduction in dealerships not only will cut the absolute number of potential advertising accounts, but also likely will reduce their perceived need to advertise, since fewer competitors will be trying to sell the same customer the same vehicle. Even if the Toyota dealers in Southern California sell four times as many cars as the average Ford shop, they aren't buying four times more advertising to do so. In the interests of clinging to an ever larger share of dwindling car-dealer budgets, some newspapers have reduced their mainsheet advertising rates, created standalone auto shoppers and enhanced their websites to include such features as complete, searchable lists of the used-car inventories of participating dealers. Those steps are headed in the right direction, but newspapers will have to become even more innovative in the future, if they hope to maintain their historic importance as marketing partners for car dealers. One avenue they should pursue is generating targeted leads that help dealers identify specific individuals who are about to buy vehicles or after-market products and services. While publishers get ready to pop the hood, the hazard lights will be flashing. Some former White House press secretaries are worried that Tony Snow may be dangerously politicizing the office while moonlighting as a campaign fundraiser for Republican candidates. Give me a break. West Wing lifer David Gergen, a politically ambidextrous alumnus of the Nixon, Ford, Reagan and Clinton administrations, waxed particularly sanctimonious on Tony’s extracurricular activities. Since when is the White House press secretary anything other than spinner in chief for the commander in chief? Tony is merely taking the position to its logical next level, while shrewdly grooming himself for a lucrative and powerful future in broadcasting and/or politics. By working overtly as a campaign fundraiser, the press secretary is exposing more clearly than ever the true political nature of the job. For voters who might have been fooled by his slightly more subtle predecessors, Tony’s campaign cameos will be beneficially enlightening. While I may not agree with what Tony says on the hustings, I defend his right to say it. Can anyone tell me the point of today's Page One story in the New York Times about a woman trying to determine if her father may have been involved in the death of a New York man in 1942? The article recounts at length the fruitless search by a 71-year-old woman for the truth surrounding long-forgotten events in which her late father was among several city contractors charged with graft. After the charges were filed, a young accountant employed by the father's company was killed when a tire burst as he was inflating it. Shortly thereafter, the charges against the father and others were dropped. Based on sketchy information about these events, the Times reports, "a homemade investigation began, a modern-day Agatha Christie sleuthing for an answer that no one else — no authorities, no family of the deceased bookkeeper — was demanding." Hundreds of words and a half a page of newsprint later, we learn that the the homemade investigation was inconclusive. Now, we have two mysteries instead of one. First, is whether foul play was involved in the accountant's death. Second, is how the story got into the Times. There’s nothing wrong with tying pay to performance, as the Boston Globe proposes to do in its newsroom. But the newspaper’s proposed incentive program appears to be unclear on the concept. As reported by Editor and Publisher, the Globe wants to make future newsroom raises contingent on increases in the newspaper’s revenues. If revenues for the print product go up by a sufficient amount, the newsroom wins. If they don’t, then it will be tough noogies for the newsies. Economic incentives have proven their value since the dawn of capitalism. They work equally well for migrant agricultural workers and chief executives, with the exception that farm laborers don’t have the same opportunity as CEOs to tweak the program when there isn't enough low-hanging fruit. The problem with the Globe’s plan is that it ties pay to performance that the newsroom can’t possibly influence, unless reporters are to be issued order pads so they can start selling ads. If sales falter through no fault of the newsroom, the resulting payday blues conceivably could translate into less enthusiasm, lower quality and a less compelling product. The greatest irony in the proposed Globe plan is that pay incentives are tied only to print sales, even as the newspaper, like most others, is mounting a major strategic initiative to build its digital media business. The Globe undoubtedly is counting on the professional pride of its newsroom to sustain the quality of the product, regardless of the idiosyncracies of compensation program. To successfully transform itself as a serious competitor in the digital age, however, the Globe, like all news organizations, will need to attract and retain the strongest, most creative journalists it can get. An upside-down incentive program isn't going to help. Managers should remember that incentives cut both ways. And negative ones cut the deepest of all. This has been a rough week at the Miami Herald, what with the publisher resigning and the editor having to explain why his staff didn’t pursue a bunch of “naughty” Mark Foley instant messages that came into its possession months ago. So, it is perhaps understandable that editor Tom Fiedler felt the need to unburden himself this morning with a Page One apology to his readers. But the mea culpa had nothing to do with the above issues. It was prompted by something that he said, which he wishes he hadn’t. The problem is that Tom never tells us what he said, which he wishes he hadn’t. Thus, it was left to the NBC affiliate in Miami, among others, to tell us that Tom likened certain critics of his newspaper’s coverage to "little Chihuahuas nipping at our heels." Although it is difficult to pen an apology without reiterating the offense for which you seek forgiveness, there is a better solution than confounding the readers the way Tom did. In covering news about the newspaper, the better approach is to write a straightforward story that reports the incident, incorporates balanced comment and includes whatever apologies are deemed appropriate. This would be fair not only to the injured party but also to the innocent reader. With non-traditional media generating roughly 5% of the sales at the average newspaper, it’s understandable why many publishers devote 95% of their energy to the eroding print ad business. But publishers fixated on the traditional source of sales are making a big mistake, because the only hope for the industry lies in generating at least 25% of sales by 2016 from sources other than the traditional print product. Absent an unforeseeable upturn in the print ad business, a newspaper failing to generate 25% of its sales from non-traditional sources within 10 years will suffer something between flat to negative over-all revenue growth. Because payroll, benefits, newsprint, fuel and other operating expenses surely will continue rising over the decade, a newspaper with flat to negative revenue growth will slide into contraction, unprofitability and eventual liquidation. Based on average annual print sales growth of 0.5% since 2001, I am projecting yearly sales increases at this level from 2006 to 2016. While some may argue that this is too pessimistic, a growing number of analysts are haircutting their sales expectations for as far into the future as they dare to peer. Merrill Lynch now believes ad sales will be flat this year and down 1.5% in 2007 (vs. a previous forecast of a 1.1% gain). If ML is right, then my projections are way too rosy and newspapers will have to find more non-traditional revenues than I hypothesize. 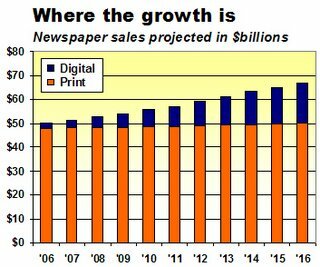 On a brighter note for newspapers, digital sales have been growing at better than 30% for the last couple of years and are projected to keep gaining by that magnitude in the near future. But it is unrealistic to expect such robust growth to continue indefinitely. Accordingly, my projections assume a 32% growth rate in 2006 and then begin to scale down evenly each year to 11% in 2016. The resulting projection (illustrated below) shows that a 25% revenue contribution from new media by 2016 could increase combined print and digital sales in the 10-year period by a compound annual growth rate (CAGR) of 2.8%. While this is not exactly torrid sales growth, the rate should be sufficient to achieve a modest but consistent increase in profitability for publishers, so long as expenses can be limited to something as close as possible to a 2% CAGR. If you cut the digital contribution in 2016 to 12.5% of total revenues, then consolidated sales fall to a 1.5% CAGR. This growth rate likely would not be sufficient to cover rising expenses, regardless of how much newshole, health insurance and headcount were cut. No business can survive for long if expenses outpace sales. The Newspaper Next task force working to come up with ideas to reinvigorate the industry urges publishers to formally set aside a significant percentage of their time to develop new on- and off-line products to serve the needs of their readers and advertisers – and, significantly, their NON-readers and NON-advertisers. The managers at one of the papers participating in the project report that they now fruitfully focus 30% of their time on revenue-generating projects that do not involve the core paper. With people focusing 95% of their attention on the main product and 30% on new ideas, it looks like it will take 125% worth of effort to restore the health of the industry. Unfortunately for the stressed-out souls trying to save our newspapers, that sounds about right.